Free 5 Year Manufacturers Warranty Special Offer! Oops - we don't appear to have a video for the DS-510. Excellent scanner for the money; the software seems a little slow to process information before creating the output file but this is not a problem in our office. The unit is neat, compact and appears to be well-made and of durable quality. The WorkForce DS-510 scanner brings a new level of efficiency to your busy business with fast, easy, document management. Scan documents, business cards, ID cards and more directly to popular cloud services2 with the included software and intuitive one-touch scanning. Boasting speeds up to 26 ppm1 and a built-in Automatic Document Feeder, the DS-510 can scan stacks of documents in no time. Easily create searchable PDFs or documents you can edit when you need to. This compact performer even features advanced color and image adjustments. Best of all, it’s compatible with most existing office software, with both ISIS and TWAIN drivers available. The WorkForce DS-510 makes it easy to scan and edit documents, create searchable PDFs, and save critical documents as PDF files to archive or access later. 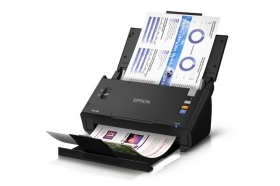 It can also scan oversized folded pages without using a carrier sheet. Both sides will be scanned, stitched together and saved digitally. The DS-510 also accommodates stacks of business cards and rigid ID cards.